Do you sit for more than an hour or so a day at your laptop? 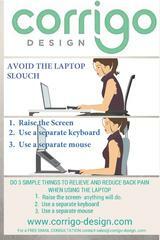 Did you know that using a laptop, as it is, just encourages a slouch? Over time this will really not be good for your back. Are you at your laptop now – if so, are your arms stretched out and your back slouched in a C shape as you try and type and read the screen at the same time? This is the typical laptop slouch.